Carl George is a curator and an artist specializing in experimental film and collage. 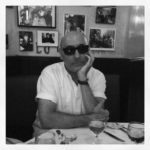 He is a founding member of the art collective Allied Productions and has been actively involved with ABC No Rio and other arts organizations in New York City for more than thirty years. He has curated art exhibitions for The Armand Hammer Museum, The New York Department of Cultural Affairs, Participant, Inc., The Kinsey Institute, Warner Brothers, Paramount Studios and Cinecitta Studios, Rome. Carl currently lives near Detroit, Michigan. Many of his short experimental films have shown in festivals internationally and are in the permanent collections of the Museum of Modern Art,the Whitney, the Guggenheim Museum and the New York Public Library. His 1986 short film, The Lost 40 Days has recently been restored with the assistance of the National Film Preservation Foundation and is now in the permanent collections of the National Archive at the Library of Congress and Anthology Film Archives in New York. His 1989 film DHPG Mon Amour, documenting the radical advances made by people with AIDS in developing their own health care, is a classic of AIDS activist filmmaking and was recently incorporated into the Oscar-nominated documentary How to Survive a Plague (2012). My artwork is informed by signs, symbols, dreams, myths ... many things. I usually begin by creating a series of paintings or collages – pictographs that help me to formulate a story outline. Sometimes I am inspired by a certain piece of music or something I am reading. These collages and paintings usually lead toward a final product; oftentimes an experimental film work – the best artistic tool, I feel, with which to incorporate many different mediums, cultural influences and concepts. 1982 – 1990 – Live performances and art installations at The Pyramid Club, Club Armageddon, CBGB's, The Mudd Club, Danceteria, Franklin Furnace, The Kitchen, Artists Space, Dance Space. 1985 – 2000 – Wrote, directed, produced 12 short experimental film works that have been shown internationally and are in the permanent collection of the Museum of Modern Art, NYC, Whitney, Guggenheim, Tate and New York Public Library. Also shown in the New Director's Series at MOMA and at the Semaine de la Critique, Cannes Film Festival. 1989 – present – Developing a feature length film based on the novel "Old Rosa" – "La Vieja Rosa" by Cuban writer and political dissident Reinaldo Arenas. 2006 – Curated and designed an exhibition of artworks, objects and ephemera from the Kinsey Museum in West Hollywood, CA in conjunction with the release of the film Kinsey starring Liam Neeson and Laura Linney. 2004 – present – Created dozens of new mixed media collage works based on classic American quilt patterns. 2005 - Curated an exhibition of films stills in Hollywood, CA from Cinecitta Studios, Rome to coincide with the 2005 Academy Awards Ceremony. 2008 – Curator, organizer and exhibiting artist for "Scorched Earth" an exhibition in New York City and Los Angeles addressing the devastation of urban centers and indigenous communities by corporate developers. 2007 – present – Developing 2 new experimental film works, "Color Me Alcohol" and "International Scullery Maid". Creating collages, writing and sound as initial step toward completion of projects. 2013 / 14 – Curated the Gordon Kurtti Project at Participant, Inc. New York, a retrospective of the artwork of Gordon Kurtti. 2015 – Created series of new paintings, collages and drawings. 2016 /17 - Curated four exhibitions at Artspace City Hall Lofts in Dearborn, Michigan. Exhibited at the Museum of the City of New York, AIDS at Home exhibition.